“The way of the mind is a muse that shapes the emotions of our everyday life. To me, the abstract is something very specific that can be rearranged on the canvas and “filled” with colours. Each of viewer makes his or her own choice. Everyone must find their own path and put their heart into the experience!” Ta Dinh Khiem – April 2015. 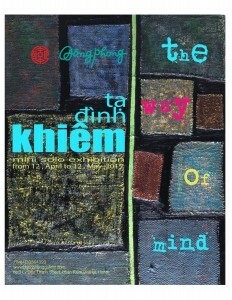 Dong Phong Art Gallery is delighted to present the newest works by artist Ta Dinh Khiem in the mini Show “The way of the Mind”.